Safe, fast, quiet sharpening for the classroom! 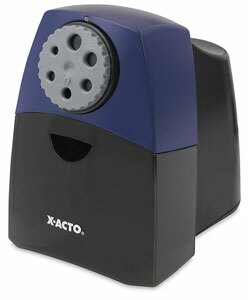 Designed by teachers for teachers, the X-Acto Teacher Pro Pencil Sharpener combines safety and economy in one package. SmartStop technology shuts the sharpener off when the pencil is sharp to avoid oversharpening, extending the life of your pencils. A SafeStart feature keeps the motor from starting until the shavings receptacle is in place, and an Auto Shutoff feature prevents overheating. The Teacher Pro features a quieter, more powerful motor, and a 10-year warranty. ® X-Acto is a registered trademark.™ Teacher Pro is a trademarks. SmartStop is a trademark. SafeStart is a trademark.